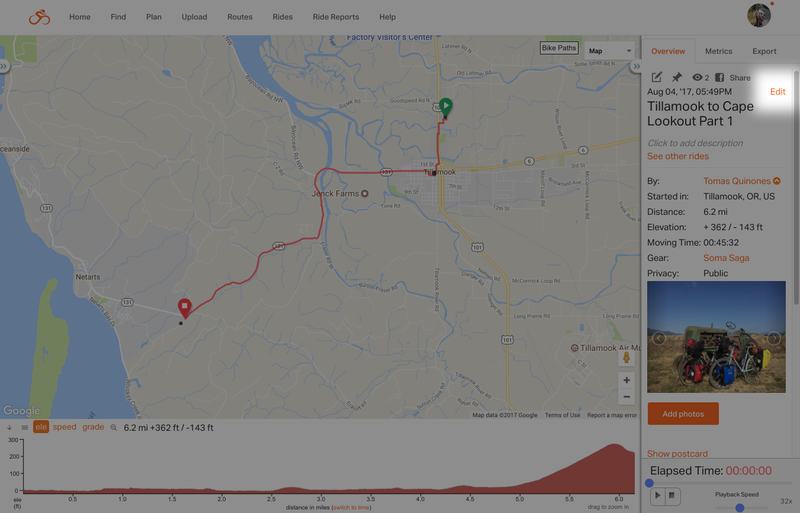 If you’ve taken a multi-day ride or recorded a ride in two parts that you now want to join together, read on to learn how to use the Join Rides tool to make two ride tracks into one. The JOIN RIDES tool is a feature for Premium subscribers. In this example, I ran an errand on my lunch break and recorded two trips. The first trip was to the copy center; the second trip was back to my office.I’ll start by viewing my first ride. Click EDIT in the right side panel. 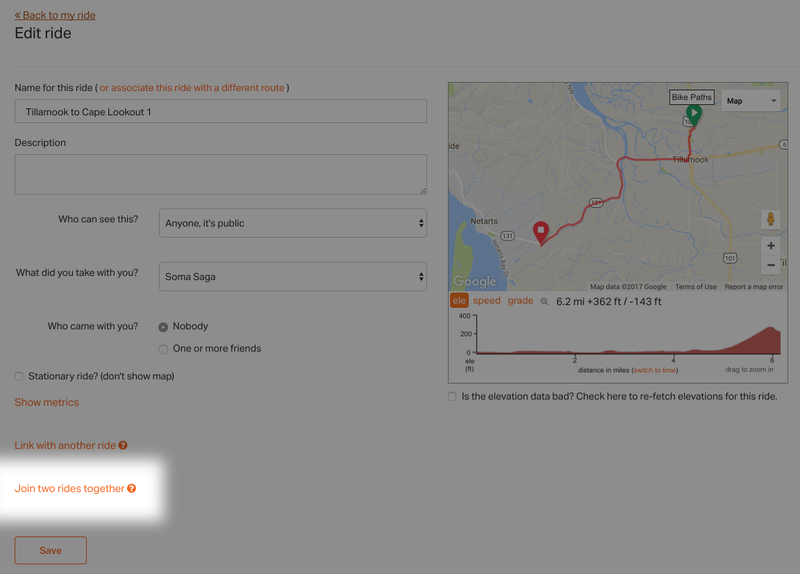 Click the JOIN TWO RIDES TOGETHER link near the bottom of the page. This will pop up 2 rides available to join with your current ride. They will have taken place before or after the ride you are currently viewing. Click on the name of a ride to view it in a new tab. Click the JOIN button next to the name of the ride you wish to join. Two rides that are joined will create a new third ride as a result. The two parent rides will not be affected. You’ll be taken to the resulting ride and a prompt indicating the combined name. Click OK to view the results. After you confirm the two rides are joined to your satisfaction, you are free delete the original rides or keep them in your ride history. If you joined two tracks that don’t match and want to undo your work. 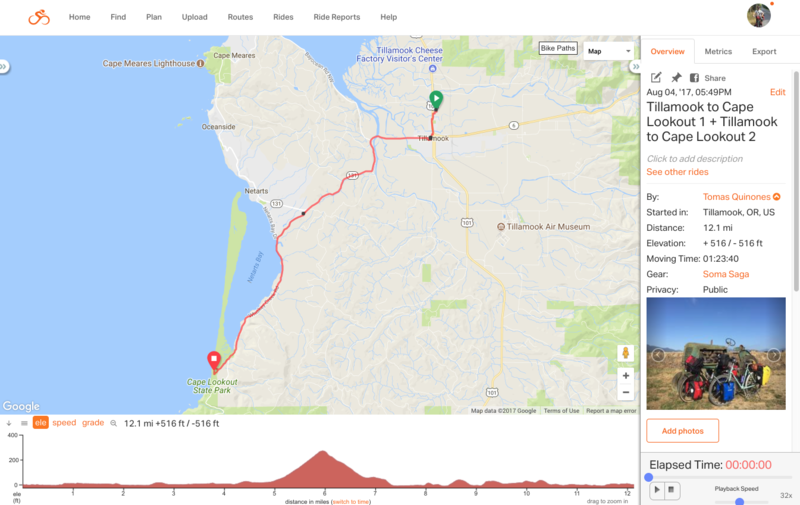 Use the delete selection tool in the elevation profile as demonstrated in Ride Cleanup. Your ride metrics will be automatically recalculated based on the data of both rides regardless of the amount of time between them. Use the REPLACE ELEVATION in the right side panel if your elevations between the two rides are not consistent. Any distance between the end of the first ride and the start of the second ride will be rendered as a straight line. Joined rides are a full copy of the two parent originals. Deleting the originals after joining will not affect the joined rides.